Isabel Murrow is precariously balancing her career and her family. Hard-working and caring, worried but supportive, all Isobel wants, in a perilous world of bullies and temptations, is to keep her daughter Phohebe safe. 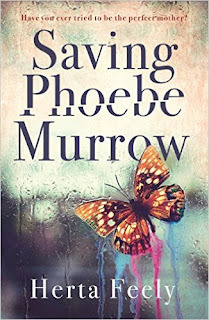 Saving Phoebe Murrow is a book that took me back a few years to being a teenager at school surrounded by bitchy, cruel girls who were always ready to knock you down with their comments. Every school and year group has bullies but this book in particular is about the desperately sad cyber-bullying of fourteen year old Phoebe. It’s a brave story, shocking in its honesty and naturally at times quite an uncomfortable book to read. The author’s writing is very engaging and this book has been niggling away at me for days because the themes of the story have stayed with me and the characters, as horrible as some of them are, are difficult to forget. Guest Post: Sierra Cartwright - You Write WHAT?